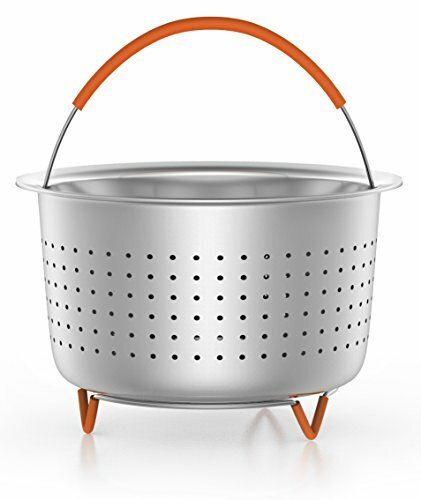 Steam eggs,vegetables, fruits and many more and make an endless number of recipes using our stainless steel steamer basket. Food grade BPA free heat resistant silicone handle and feet. Lift your basket with the premium silicone handle safely and easily and the silicone feet will prevent the scratching of your instant Pot; scratching occurs with steamer baskets without silicone feet. In addition the silicone feet provides stability, as it grips onto the surface it is placed on and prevents accidental spillage. We at Unique Impression, consider customer satisfaction our upmost priority and have paid attention to every detail in the manufacturing of our steamer basket. And you can rest assured that you will receive your basket in perfect condition, without any nasty sticky residues which other brands baskets have. Compatibility: Fits perfectly in Instant Pot 6 and 8 quart and other brands with similar size. If you have any questions about this product by Unique Impression, contact us by completing and submitting the form below. If you are looking for a specif part number, please include it with your message.